MANILA, Philippines - Following the untimely deaths of 196 cyclists, cycling enthusiasts have called on incoming President Rodrigo Duterte and incoming Vice President Leni Robredo to create bicycle laws to protect all cyclists. 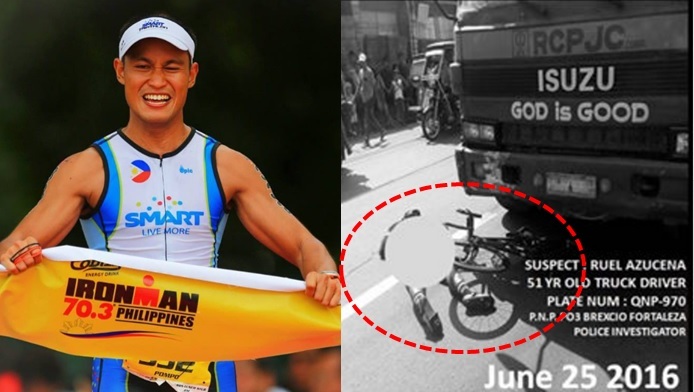 We Want Bike Lanes in RP Movement on its Facebook page detailed the tragic death of Mark “Pompo” Arroyo, a 32-year-old triathlon athlete and team captain of the Smart Tri-team. Arroyo, who tied the knot in March last year and was expecting his child in the next months, was killed by a wayward truck near Avida Subdivision and Dalig National High School Baranggay Dalig in Antipolo, Rizal on Saturday, June 25. Ruel Azucena, the driver of the truck with plate number QNP 970, is currently in jail pending inquest proceedings. PNP PO3 Brexcio Fortaleza is handling the said criminal case. “196 have been Killed. 7,464 have been Disabled. Breadwinners & Children die like stray dogs. They are the backbone of this country. Yet no one remembers & seeks to solve this,” reads the post. On February 10, 2011, former Senator Manny Villar filed Senate Bill No. 2688 or the Bicycle Act of 2011, which promotes the use of bicycles as an alternative mode of transportation. Under this bill, all main roads and highways must be provided with bicycle lanes or ways identified by the Local Bikeways office. Moreover, the bill provides for the creation of bicycle parks in each city and municipality where provisions for bicycles are present. Motoring journalist James Deakin also expressed his support to the bereaved families of Arroyo and other killed cyclists through his Facebook post. “If nothing is done about this, we can no longer call them accidents. Enough already. Cyclists are tax payers too. We need protected bike lanes, stricter enforcement and tougher penalties,” he wrote in his post. To provide a glimpse into the life of a cyclist in Metro Manila, Deakin also posted a 10-second video clip showing the dangers a certain cyclist needs to deal with just to get to work everyday.